The Google Nexus 9 is the first tablet to run Android Lollipop 5.0. The 8.9" screen (IPS LCD TFT Display, resolution of 2048x1536) is big enough to work and watch on, but small enough to carry around in one hand. If you have some favorite movies on DVD and want to transfer them to Nexus 9 for enjoyment on the move, you've come to the righ place. This article will show you a simple guide to help you rip and convert DVD to Nexus 9 playable MP4 videos while keeping the original quality. Here we go. In fact, it is easy to watch DVD videos on Nexus 9 as long as you got a suitable DVD Ripper in hand. These software programs vary, so you might be confused when you have to choose one. 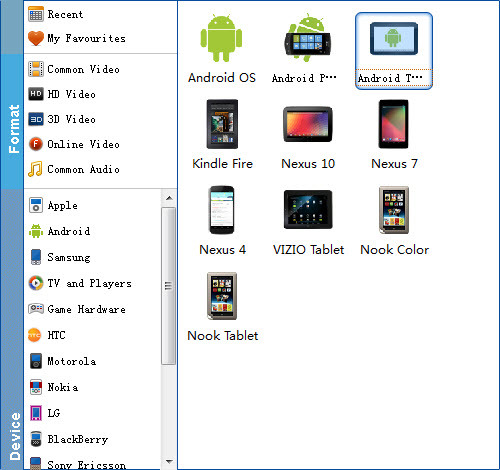 If so, you are recommended to use EaseFab DVD to Android converter. It's rated as the best solution out there to convert DVD movies to Google Nexus 7. With a few clicks, you can rip DVD to Nexus 9 (Nexus 7, Nexus 10, Nexus 6 and other Nexus gadget) succesfully so that you can play DVD movies on Nexus 9 anywhere. In addition, this DVD ripping tool can also convert DVD to various popular video formats like AVI, MP4, WMV, MPEG, MOV, FLV, MKV, 3GP, etc. as well as rip DVD to optimized video for playback on iPad, iPod, iPhone, Zune, Creative Zen, Archos, iRiver, Blackberry, Xbox 360 and more.If you are a Mac user, you can turn to EaseFab DVD Ripper for Mac (Yosemite included), which has the same function as the Windows version. This quick start guide takes DVD Converter Windows version (Including Windows 8) screenshots as an example. The method to convert DVD movies to Nexus 9 on Mac is the same. All that you should take care is to download the right version according to your situation. Launch the program and click the Load DVD button to import the DVD movies you want to rip. As you see, all added files will be listed below and you can preview them, take snapshots, choose subtitle and audio track, etc. as you like. Next, select a proper output video format. Here you're recommended to Choose "Nexus 10" or "Nexus 7" from "Android" category. The output videos also fit Nexus 9 nicely. Tips: If you're not satisfied with the output quality, you can click on settings you could easily set bitrate, frame rate, codec, channels, sample rate, etc to adjust parameters that affect video quality and file size for the video you prefer. keep in mind that bitrate higher results in big file size, and lower visible quality loss, and vice versa. After all necessary settings, simply click the big Convert button to start ripping the added DVD files to Nexus 9 compatible videos. Wait for the conversion to complete and click "Open" button to get the converted videos instantly. After that, transfer them to your Nexus 9 tablet and watch them anywhere you go. Just enjoy your movies!